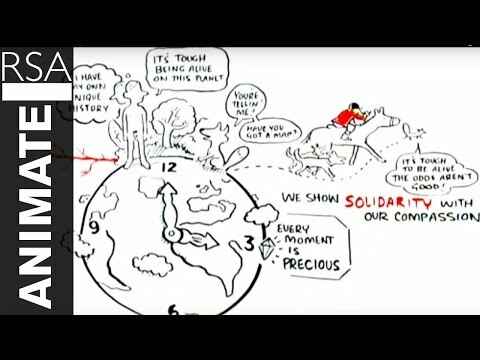 Like I promised in my previous post, here comes another clip from RSA Animate, presenting a speed paint to a talk by Jeremy Rifkin called ‘The Empathic Civilization’. It is about the question of how we (and apparently also other mammals) feel empathy for something that can be observed happening to others. Like when we watch a movie, the same neurons fire in our brain processing what we see as if we would experience it ourselves. Scientists call this function in our brains the mirror neurons. It is a remarkable discovery and he is talking about how it might have evolved from the bond that our ancestors in the cave had with their tribe (viewing other tribes as aliens), to religious groups believing to belong to each other up to the bond we feel towards the people of our same nation (and in many cases being hostile towards people of other countries). He then poses the very interesting question, if this evolution could extend over the whole planet to make us feel connected to one another as a whole ecosystem. This is especially interesting to those who are working on ways how to convince people that we are not so different from one another. We should really stop treating people from other countries, religions and families as aliens. This is a very outdated concept in many parts of the world. The idea that, with our technology advances, it could be some day possible to overcome the differences between all of us and create what he calls the empathic civilization – where we act as a family of beings and not individuals. Think of the possibilities in sustainability and social equality that arise if we could just trigger these mirror neurons in each and every one of those who still live by the imaginary boundaries of nations, blood ties and religions.